Cutting and serving cake at a wedding is one of the longest standing traditions. However, more and more we’re seeing a change in the times. More and more couples are choosing to forego the cake cutting all together. Skip the showmanship of wheeling the cake into the middle of the room for a grand slicing and give guests what they really all want: options. There are couples who choose to modernize their cake cutting, and then there are those who ask another question entirely: Do we have to serve wedding cake? Our answer: no! Our answer is not entirely unique as many couples embrace dessert in the form of a bar. From ice cream and s’mores to churros and mini desserts, there are more options than you can begin to imagine for your wedding dessert bar. And, only one involves cake. Take a peek at 10 of our dessert bar suggestions below, and let us know what you might want to serve in the comments! There are few things more iconic to summer than ice cream! If you choose to serve it, there are a few options at your fingertips. Think about offering guests the opportunity to create their own sundae, hire an ice cream or gelato truck to arrive as a treat, or serve ice cream sandwiches that are pre-made for guests to grab and go or complete with all of the necessities for them to create themselves. If you’ve ever been to camp or attended a bonfire, you know how enjoyable s’mores are to make and enjoy. Some venues are even including them to their menu for you to add as a delicious and enjoyable experience for your guests. Make sure to have graham crackers, chocolate, marshmallows, and sticks available. Another idea: serve them pre-made to save guests’ hands from the potential mess of gooey marshmallows. Why popsicles? They’re a great, light treat to keep guests cool during summer weddings! A popsicle bar doesn’t have to be relegated to your reception either. You can serve them as a cool treat for guests to enjoy prior to your outdoor ceremony. If you serve them in the evening, don’t be afraid to serve them spiked with champagne! When we happened upon this wedding, we immediately thought of flamenco music and jamon hors d'oeuvres! Churros are a Spanish inspired treat, and the dough paired with cinnamon always makes us think of celebratory nights with friends or evenings spent at the fair. Plan to serve them plain, or add a toppings bar for guests to dip their churros in a variety of options, including chocolate sauce, sprinkles, and candy. We did want to suggest one cake option, but we wanted to stray away from cupcakes. Think about serving bundt cake! Bundt cake is available in many different flavors and combinations, and can be customized to anyone's liking. Order a range of flavors, plus there are a variety of sizes available from popable bite size to full-slicing cakes). Cookies are a wonderful favor option, and they also work so well as the main event at a dessert bar. Plan to serve your individual favorite cookies and the flavor you’re most drawn toward as a couple. You can also honor your wedding’s location by serving the cookie the city is most famous for. If you have family members who are excellent bakers or just asking to help in any way possible, ask if they might be willing to whip up the recipes most loved by your family. It’s a great way to welcome heirlooms to your celebration. Donut walls are increasing in their popularity, but the problem is they often have to be restocked. Rather than creating a wall, place donuts on cake stands and platters. Make sure to order a variety of your favorite flavors (or just those that match your wedding’s palette), and plan to place signs indicating the name and ingredients in each one. Serving pie or cobbler at a dessert bar is a go-to because it can be enjoyed all year long. Similar to cookies and donuts, have a few flavors available so guests can have options when making their dessert decision. Serving cobbler or deconstructed pie in jars, just like above, makes this bar idea simple because everything is portioned into single servings for you. Plus, guests can enjoy some at your wedding and take the rest home for a snack later in the evening (or early morning!). Think about pairing your favorite flavors with family favorites too. If you’re hosting a brunch wedding, waffles are a must! Plan to have a make your own waffle station with classic Belgian style waffles and plenty of toppings. If your wedding is in the evening, you can opt to offer all of the options you would normally enjoy at breakfast (think: syrup and fruit) and pair them with ice cream. It’s the ultimate sweet treat! 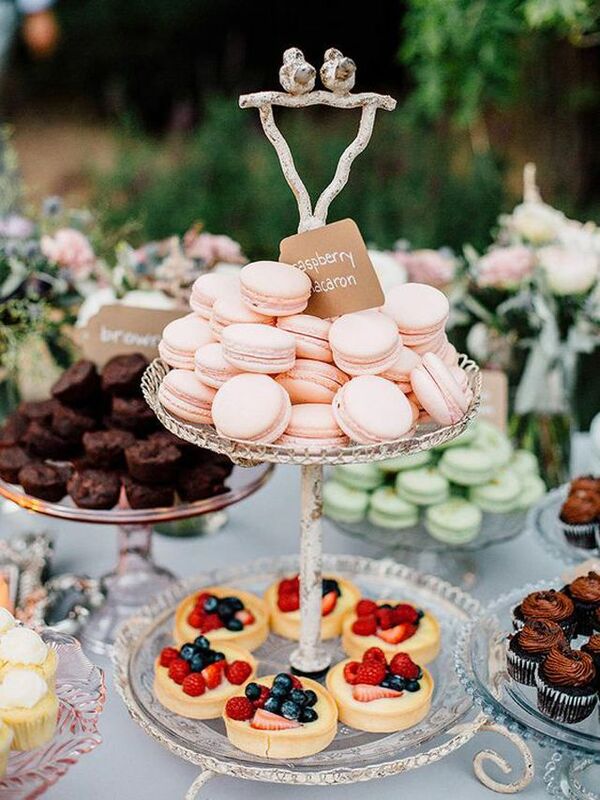 Mini desserts have become a classic wedding option, and for good reason – you can combine many of the options we’ve mentioned throughout together in mini form to offer a complete variety of sweet treats to your wedding guests. Pie, cobbler, cookies, tarts, parfaits, and even cake can be on your mini dessert bar menu. We promise there will be something for everyone!